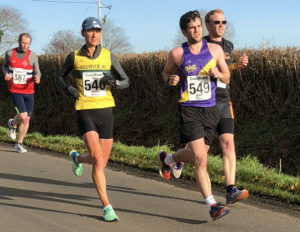 The 66th Border Harriers’ Brampton to Carlisle 10-mile road race took place on Sunday 19th November, setting off from the William Howard School in Brampton at 11.30am. Robert Danson (Wesham RR) was first past the finish line, with an impressive time of 50:06. James Douglas of Border Harriers was second in 50:11 and Marc Brown came in third with 50:15. Keswick AC’s Sam Stead took almost four minutes off his hillier Derwentwater 10 time from two weeks previously; finishing in seventh place with a great time of 50:50. First lady was Sophie Cowper of Rotherham Harriers, who finished in 56:23. It was a Keswick AC club counter so lots of yellow and green vests out, with some very impressive times: Nathan Postill, finishing third in the U20 category in 59:14. Graham Airey was seventh in V40 with 60:02; Ross Butler finished with a PB of 63:31. Sam Ayers was second in the L45 category in 65:46. Michael Mallen finished in 67:38, Mark Rutherford 69:09, Patric Gilchrist 79:34, David Ferrier 82:35, Nicky Butler 83:54, Chris Clark, 85:29, Kim Clark 90:46, Marie Nunes 98:23. Well done to all. Thanks to Patrick Butler for the photos.